In the interest of fairness, we have reproduced the entire article that is generally used by Jehovah’s Witnesses to summarize the 1914 doctrine. It is reproduced “without interruption” on the jw.org site (link appears with the article below) and here again on this site for easy reference. It is also quoted in its entirety on this page, although here it is interrupted with questions, issues and comments. The material that comes directly from the article will be presented here in blue text and the rebuttal material is presented in red text. Links generally appear in green text. Where links appear in Watch Tower material they will often link back to jw.org. And where links appear in rebuttal material, they will usually link to additional articles found elsewhere on the pages of this site, unless otherwise noted. DECADES in advance, Bible students proclaimed that there would be significant developments in 1914. What were these, and what evidence points to 1914 as such an important year? WHAT DID THE BIBLE STUDENTS REALLY TEACH? This is extremely misleading! On its own, the first sentence is technically true, but it is combined with the question, “What were these…?” as if we could (or should) look into what those “significant developments” were. The introduction implies that these Bible Students were proclaiming in advance something that was true about these significant developments, something that some evidence might still point to, so that we, too, can review that evidence and see what they had found that made 1914 such an important year. The reason that this “evidence” is only hinted at and none of that evidence is presented in the article becomes quite obvious when we discuss that question in more detail here. There is therefore a certain irony in using Matthew 24 to support the doctrine, because Jesus’ answer to the disciples’ question about “When will these things be?” doesn’t start out with an answer, but with a warning. “Do not be misled”. 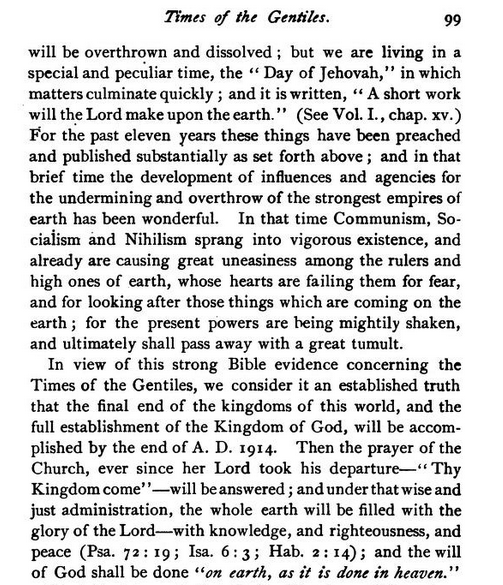 Luke’s version includes the command: “Do not follow those who say, “The time is at hand.” However, “The Time is At Hand” (1889) just happened to be the title of the Watchtower’s primary book about what would happen in 1914. This was, in fact, the primary place “documenting” just where it may be said that, “decades in advance, Bible Students proclaimed there would be significant developments in 1914.” The book listed out a number of expectations (see especially pps. 77, 78) and all of them failed. So, the idea that was given significance for decades in advance was that Jesus was NOT king in 1914, but in 1878. In fact, much more space in the 366-page book (and other Watch Tower publications during this period) is devoted to showing that the “parousia,” or “presence” of Jesus began in 1874, and that he was enthroned in 1878, and that the Antichrist (the Papacy) had already ruled 1,260 years until about the time the Last Days began in 1799 (p.296). It’s true that the Watch Tower and the Bible Students also used phrases that included “a time of trouble” and “end of the Gentile Times” with reference to 1914, and these phrases are still used today in the pages of the Watchtower. It would be dishonest, however, to change the meaning of those phrases so that it appears they had somehow got at least some part of the prediction correct. If someone predicts that the World Series will be won by the “Yankees” and they lose to the Boston Red Sox, you can’t then argue that people in Boston have also been historically called “Yankees.” In reality, during the decades before 1914, the Watch Tower had argued that Armageddon had already commenced, and the culmination of a great “time of trouble” was expected to grow worse in the decades before 1914 until that year would finally see the end of the time of trouble. “But bear in mind that the end of 1914 is not the date for the beginning, but for the end of the time of trouble.” – Zion’s Watch Tower, July 15, 1894. page 226. It could not last beyond the “end of 1914” which was specified to be either October 1, 1914 or a maximum of a one-year period from about October 1914 to October 1915. So, too, with the expression, “end of the Gentile Times.” It is clear that this is “the final end of the kingdoms of this world” (p.98) and “the complete overthrow of earth’s present rulership” (p.101). The import of the phrase is found on page 278, where it becomes clear, in context, that the “civil power of the earth” wou ld pass out of the hands of the Gentiles and “fully into the hands of the true Church” by1914. What were these false predictions? Why did none of them come true? What is the evidence that led them to point to 1914? What is the difference between ‘false prophecy’ and proclaiming false significant developments for decades in advance, and not seeing even one of those predictions come to pass? Why did 100% of what was predicted fail? More importantly, why do Jehovah’s Witnesses dishonestly imply that at least something that Bible Students proclaimed about 1914 must have been predicted correctly. The Watchtower publications have elsewhere presented this same idea with slight rewording to imply that while the Bible Students didn’t understand exactly what to expect, that they still got something right, at least. At other times, the Watchtower has blatantly made statements about what they expected that are explicitly false. It’s not difficult to see that the above article in “What Does the Bible Really Teach” utilizes only a slight rewording of previous Watch Tower publications, such as the following quotes reproduced here from the 2013 Watchtower Library CD-ROM. Similarly, a prophecy providentially caused sincere 19th-century Bible students to be in expectation. By linking the “seven times” of Daniel 4:25 with “the times of the Gentiles,” they anticipated that Christ would receive Kingdom power in 1914. For over thirty years before that date and for half a century since, Jehovah’s witnesses have pointed to the year 1914 as the time for the end of “the appointed times of the nations” and the time in which Christ would begin his Kingdom rule. The Watch Tower Society of witnesses for Jehovah was right in its thirty-year public campaign of warning the Gentile nations of the fateful year 1914. 4 Why, then, do the nations not realize and accept the approach of this climax of judgment? It is because they have not heeded the world-wide advertising of Christ’s return and his second presence. Since long before World War I Jehovah’s witnesses pointed to 1914 as the time for this great event to occur. And since 1914 physical evidences establishing this truth have been pointed to repeatedly in the columns of The Watchtower. In reality, of course, the Watchtower never spoke, decades in advance, of 1914 as being the “beginning” of a time of trouble. Nor did they speak of 1914 as the time of Christ’s second presence. nor did they speak of it as the time when Christ would begin his kingdom rule. During World War I (1914-1918 C.E.) the dedicated, baptized remnant of spiritual Israelites publicly proclaimed that the Gentile Times had ended and that the Most High God had made his Son Jesus Christ reigning King in the heavens. They did understand that there was a significance to the year. Primarily they thought that 1914 would just be the start of the judgment coming upon the world or Armageddon. Just looking at the sign of the times that Jesus told us to look at, is enough, but it is still significant that they could pinpoint that year. That’s phenomenal. There are many inaccuracies in the video, although it gives the impression that it’s open and candid about the mistaken views. Yet it clearly is intended to continue the narrative that the Bible students had some divine guidance in their ability to pinpoint that year in advance. And it clearly provides false information here in saying that the Bible students “had reasoned” that Christ would begin ruling in 1914. 6 When would “the appointed times of the nations” end and God’s Kingdom rule begin? … As that “time” approached, Jehovah took steps to reveal the answer to a group of humble Bible students. With the help of God’s spirit, they discerned that “the appointed times of the nations” began with the destruction of Jerusalem in 607 B.C.E….From this, they deduced that 1914 marked the end of “the appointed times of the nations.” They also came to realize that 1914 was the beginning of the end for this system of things. As a Bible student, can you explain from the Scriptures how the date 1914 is calculated? Clearly this same type of statement has been repated often, but it is misleading and deceptive because there were no significant developments that were predicted decades in advance that actually came to pass in 1914. Doesn’t “End of the Gentile Times” mean End of the Gentile Nations? Why go so easy on them? Jerusalem had been the capital city of the Jewish nation—the seat of rulership of the line of kings from the house of King David. (Psalm 48:1, 2) However, these kings were unique among national leaders. They sat on “Jehovah’s throne” as representatives of God himself. (1 Chronicles 29:23) Jerusalem was thus a symbol of Jehovah’s rulership. So the passage is about some time period that is about to start, ABOUT TO BE fulfilled, not something that referred to a previous trampling during a line of active kings of the house of David. If the verse is about how Jerusalem WILL BE trampled on until the times of the nations are fulfilled then it would start in the year 70 CE, in that very generation that Jesus said would live to see all these things fulfilled. How and when, though, did God’s rulership begin to be “trampled on by the nations”? This happened in 607 B.C.E. when Jerusalem was conquered by the Babylonians. There are logical reasons, using the Watchtower’s own argument, not to equate Jerusalem, at the time Jesus mentioned it in 33CE, with “God’s rulership.” The Watch Tower admits there had been no king representing Jehovah’s throne there for over 600 years. But the real problem here is still the fact that some slippery wording is being used to change Jesus words, “Jerusalem will be trampled” with a question that removes the future tense. It’s a case where the question is trying to shift away from the sense of the original statement. So this question about “how and when did God’s rulership begin to be trampled” is misleading. The real question is “Why don’t we take Jesus at his word that Jerusalem WILL BE trampled, and therefore it is not now being trampled (since 607 or 587). It was trampled then, to be sure. And it was trampled once by David when he captured it several hundred years before that. And it was trampled by the Greeks just a couple hundred years before Jesus spoke. The very idea that Jerusalem was currently undergoing a trampling in 33CE rips away the context. Remember that the very start of the discussion is about how and when this beautiful city with it’s magnificent buildings will suffer a predicted catastrophe. The question of the disciples was about how surprised they were to learn that this rich and glorious, currently untrampled city, would soon suffer a catastrophe? The original question and Jesus’ answer have remained on topic. They were both about how and when Jerusalem would soon be trampled by the nations. Of course, throwing in the 607 BCE date with no explanation is extremely misleading and is a clear case of academic dishonesty. Why? Because Jerusalem was NOT conquered in 607 BCE. The year, 607 BCE has become such an important date for Jehovah’s Witnesses to utilize in support of 1914 that it is merely claimed without any mention of the fact that no one has ever found evidence that this 607 date could ever possibly be correct. The 607 BCE date is not accepted by any Biblical or secular scholars, archaeologists, or historians outside those who hold to a belief that 1914 is the end of the Gentile Times. While it is not accepted elsewhere, we believe it is a probable or at least a possible date, because it fits well with our beliefs. Of course, all the evidence still shows that it is not probable or even possible, because there is so much consistent evidence to the contrary. Every bit of evidence to the contrary is just ignored. And, except for serious historians and scholars, most persons would be quite surprised to find out just how much real evidence there is that 607 an absolutely wrong date for the destruction of Jerusalem. It includes Neo-Babylonian letters, bank records, receipts, diary entries, and newspapers (chronicles). There are literally tens of thousands of pieces of evidence that contradict the 607 date. Not only that, but there has never been an honest discussion of the 607 date itself in the Watchtower. It is rarely, if ever even implied that all serious scholars are able to agree on the specific time for the destruction of Jerusalem by Nebuchadnezzar, and that this date differs from dates given by all other scholars by about 20 years. Even when all evidence points to Jerusalem being conquered in 587/6 BCE, not 607BCE. The typical counter-claim by Jehovah’s Witnesses is that those who disagree are simply putting secular dates over Biblical dates. This is very misleading for two reasons, at least. The reasons, along with evidence will be provided, of course, in the 607 BCE Section. 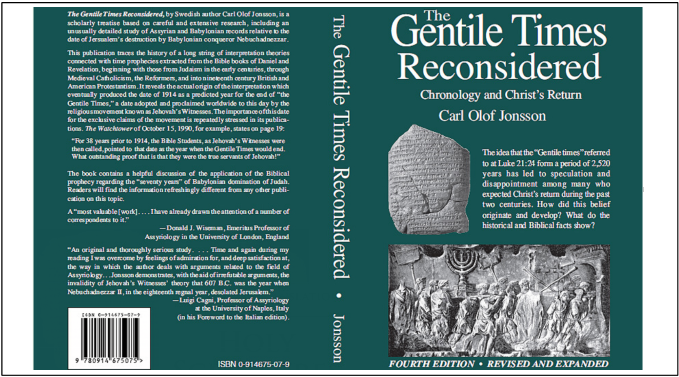 For the most comprehensive discussion of the 607 date, see Jonsson’s book, Gentile Times Reconsidered. It makes no difference that there is a promise to restore the Davidic dynasty upon the throne. All Christians already understand that Ezekiel is pointing to the rulership of Jesus Christ and there is no hint in Ezekiel of a specific future date for this appointment. Biblically, of course, it is not really Jehovah’s throne that became vacant. The Bible teaches that Jehovah sits on his throne eternally. The kings represented Jehovah in a small way by representing a nation. The one who has “the legal right” to the Davidic crown is Christ Jesus. (Luke 1:32, 33) So the ‘trampling’ would end when Jesus became King. This would appear to be true, except that the Bible presents Jesus as King in 33 CE (assuming this date for Jesus death and resurrection) and with the idea that he would return in a much more powerful way at an unknowable time in the future. The Kingdom was illustrated, spoken about and preached during Jesus’ earthly ministry as something that was already having a small beginning, as a Kingdom, but that it would bloom soon afterward into a larger and stronger Kingdom. It’s adherents were no part of this world, but were like alien residents of a new “spiritual” nation that existed due to their allegiance to a heavenly king. There is no evidence that Jesus was not already king in 33 CE. And there is ample evidence that he was already spoken of Biblically as a King, with a Kingdom. Any claim about how it makes sense that Jesus was “ruling in the midst of his enemies” in 1914 appears to be just as true of his Kingship in 33 CE. The Bible states it quite explicitly in several places. There are dozens of Scriptures mentioning Jesus as King in 33 CE as none mentioning him as King in 1914. This subject is considered in more detail in the section called Kingdom. When would that grand event occur? Jesus showed that the Gentiles would rule for a fixed period of time. Even if this were true, it would not be our place to to concern ourselves with the times and seasons. Paul said we need nothing to be written to us about the times and seasons because we know that final day will come as a thief in the night. Besides the Gentiles have continued to rule since 1914, anyway. There are even more Gentile nations now than there were in 1914. The number of Gentiles who are ruling and the number being ruled has doubled, then tripled, and now more than quadrupled, since 1914. The argument continues to get more silly and comical now that we have approached 100 years past that time. The account in Daniel chapter 4 holds the key to knowing how long that period would last. So does Jesus somehow fulfill the kingship signified in a story of how a pagan king is humiliated and punished? Just because the King was punished for his haughtiness for 7 times or 7 seasons, and we assume that these 7 seven times could mean 7 years, why do we make them 7 years in days and then turn those days into years? Why do we use 360 for the number of days in those years? Why do we say that the trampling of this pagan‘s kingship meant the exact opposite, the time of the Gentiles on the rise, and their trampling of the Messianic kingdom? God is king during this time and still has control – that was the explicit point that the pagan king learned. Why does that necessarily refer to a time when the pagan kings are in power and the Messianic Kingdom is out of power. Why do we make it the opposite, why call what is good bad and what is bad good. Why have two sets of scales? When Daniel says it’s 7 years that Neb would be down, why do we say that means 2520? Why do JWs not interpret the 1260 days, the 3.5 times, to be 1,260 years? It relates a prophetic dream experienced by King Nebuchadnezzar of Babylon. He saw an immense tree that was chopped down. Its stump could not grow because it was banded with iron and copper. An angel declared: “Let seven times pass over it.”—Daniel 4:10-16. He was the immense tree according to Daniel. The fulfillment is “YOU O King.” Nothing about a further fulfillment. Do we take the number of years that anyone else was out of power and play a numerology game with it. He was chopped down. He could not grow his kingdom or regain his kingship because He was banded with something stronger than himself. God’s will and purpose was stronger than the pagan king’s. That was the lesson. God could keep him down for as long as he wanted and still even restore the kingdom to the same pagan ruler if he so wished. In the Bible, trees are sometimes used to represent rulership. (Ezekiel 17:22-24; 31:2-5) So the chopping down of the symbolic tree represents how God’s rulership, as expressed through the kings at Jerusalem, would be interrupted. Just an empty claim that denies the solution the Bible itself gives in favor of an opposite solution. Yes trees are sometimes used to represent rulership. In this case it represented the rulership of a pagan who needed to be humiliated for his haughty boasts that gave all credit to himself. “So the chopping down of the symbolic represents how God’s rulership, as expressed through the kings at Jerusalem, would be interrupted. This is a ludicrous claim. In the tree dream the point was that God is ruler and as ruler he still has the power to interrupt a King. So somehow it represents that God’s OWN rulership would be interrupted. And this is stated matter of factly without apology. Sacrilegious at best. Dishonest and slyly manipulative at worst. Ignorance of all. However, the vision served notice that this ‘trampling of Jerusalem’ would be temporary—a period of “seven times.” How long a period is that? Not a trampling of Jerusalem but a trampling of Babylon. Babylon’s kingship temporarily taken away for 7 times. How long a period is that. Quite possibly 7 years. Although “times” doesn’t necessarily always mean the same thing in every case. Revelation 12:6, 14 indicates that three and a half times equal “a thousand two hundred and sixty days.” “Seven times” would therefore last twice as long, or 2,520 days. Nothing wrong with saying that 3 and 1/2 times is 1,260 days. The Jewish calendar was both solar and lunar. So there was no specific number of days in any 3.5 years period. The lunar month, alternated between 29 and 30 day months since the lunar cycle (new moon to new moon) was very close to 29.5 days. Every three years, or so, when 12 of these 29.5 day months had passed, it was obvious they were too far short of the solar cycle of 365.25 days, so they would give another lunar month to that particular year to make it closer to the solar cycle. So very often a specific 3.5 year period could be 1,269 days +/- a day or so, but there were 3.5 year periods that could be as little as 1,239 days if it were just prior to the month when a solar correction month needed to be added. And a lunar 7 year period could have 2538, or 2568, or even 2598 days. So a mathematical simplification that used a round number of ideal 30 days in a month may have had a certain rational appeal. Because of the variations in the lunar and solar calendars, a schematic way to estimate a year for future planning purposes or easier financial calculations had evidently been in common use for centuries, especially among Babylonian and Assyrian dominated civilizations. But the Gentile nations did not stop ‘trampling’ on God’s rulership a mere 2,520 days after Jerusalem’s fall. Evidently, then, this prophecy covers a much longer period of time. On the basis of Numbers 14:34 and Ezekiel 4:6, which speak of “a day for a year,” the “seven times” would cover 2,520 years. It seems out of place to take a “schematic” year of 360 days (which is something like a rounded year, or an idealized, estimated year of exactly 30 day months, and then say that each day of those rounded years must be expanded out using the estimate, but translated into years of 365.25 days each. The 2,520 years began in October 607 B.C.E., when Jerusalem fell to the Babylonians and the Davidic king was taken off his throne. The period ended in October 1914. At that time, “the appointed times of the nations” ended, and Jesus Christ was installed as God’s heavenly King. *—Psalm 2:1-6; Daniel 7:13, 14. Here we go again. Just giving a wrong date for the when Jerusalem fell to the Babylonians doesn’t make it right. And repeating it dozens of times each year doesn’t make it right either. And while we’re at it, even the Watch Tower’s own publications don’t claim that it was October. This is actually based on the interpreter’s own method of estimating when a year should start. That idealized assumption has been used for years in Watch Tower publications, such that it has even obligated God to create Adam in October, for example. It doesn’t matter that it could have been any month. But in the case of Jerusalem falling, we actually do have a month given in Scripture. And it’s not October. The bias toward keeping the traditional way that Second Adventists have calculated dates has never really been given a second thought. It’s second nature for the Watchtower to just claim that the Temple was destroyed in October when the Bible says otherwise. It is possible to read the entire chapter like that. It is even possible to read it with the sense that Jesus himself did not know the day or the hour and therefore didn’t know himself. He only knew that that there would be no specific sign or composite signs that could indicate the time of the end, but that it would be easy to be misled by looking at all these things as if they were signs. In fact, only after the prophecy was fulfilled on Jerusalem then that final sign could now come immediately — yet we still don’t know exactly when. * From October 607 B.C.E. to October 1 B.C.E. is 606 years. Since there is no zero year, from October 1 B.C.E. to October 1914 C.E. is 1,914 years. By adding 606 years and 1,914 years, we get 2,520 years. For information on Jerusalem’s fall in 607 B.C.E., see the article “Chronology” in Insight on the Scriptures, published by Jehovah’s Witnesses. There is no legitimate, logical or Biblical connection between “7 times” and the time when Jerusalem will be trampled. There is no legitimate or logical or Biblical reason to create a 2,520 period. It attempts to circumvent the counsel of Jesus and Paul about trying to figure out the times and seasons. There is no Biblical support for a Kingdom by Christ that formally begins on any dates except 33 CE and the Coming/Appearance (“Judgment Day”). There is no evidence that Gentile nations stopped trampling anything in 1914.